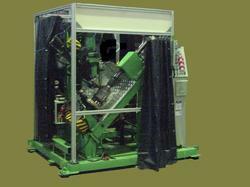 We are a leading Manufacturer of elliptical compressor welding machine from Chennai, India. Backed by an adept team of professionals, we are offering a wide range of Elliptical Compressor Welding Machine. The offered products are designed using high-quality material & sophisticated technology. These products are highly praised for its optimum quality & fine finish. In addition, our products are tested on numerous parameters of quality for ensuring its faultlessness. Customers can avail these products from us at reasonable rates. Looking for Elliptical Compressor Welding Machine ?